I was talking to someone the other week about painting and thought I might share part of our email exchange. 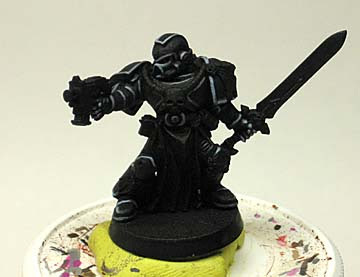 What always seems to come up is how hard it can be to paint black armour. I disagree completely. There is no color easier to paint. The most difficult thing about painting a black armoured model is painting everything else on the model. Since black is at the far end of the spectrum, there is no more shading you can do to it. Add some highlights and that's it. But that's not much to do to a model is it? The real difference is in the details. Those are what carry the model and make it look convincing. With just about any other color (except for white), you have the highlights and the shadowing to help make the model look convincing. With black, you don't have that range. You end up being forced to rely on the other details to bring the model to life. Scrimp on those and your model will look lifeless, no matter how well you paint his black armour. But this is all discussion. Painting black armour can be easy to do really... just make sure you go back and paint all your details on your model afterwards if you really want it to work. Of course I just finished a big post about trying other colors than black when it comes to priming but this would be the exception. Add the second highlight to only the uppermost edges. I'll only pick out the high spots on the model for this highlight. 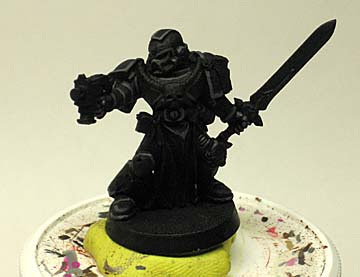 For this example, I'm using a high contrast approach so you can see where I've highlighted the model a little better. Some people like high contrast, some like subdued, some like two highlights, some like just one... pick your colors and number of highlights as you see fit but the process remains the same. If you want to see how this (painting just his armour) ties in with painting the whole model and what gets done in what order, that tutorial can be found here. And keep in mind, this isn't the only way to paint "black." Fellow painter Tim Davis (The Vanus Temple) has a completely different method for painting black that involves the use of a dark grey undercoat and a series of washes which can be found right here. This technique gets into using colors other than black and white to prime. I've got to say, after painting over 200 guardsmen with black flak army, black really is the easiest colour to paint. The only difference to you is that after the black undercoat, I put on a very very dark/black base coat as chaos black has a sort of shine to it and I prefer a matt'er base for the armour. Thanks for the tips, I just started a black armour project last night intending to try out some of the Legion of the Damned tips from the last White Dwarf. I started with a grey basecoat (50-50 Codex Grey/Chaos Black) and at first I wasn't convinced, it looked really odd against other areas of the model that were undercoated black. 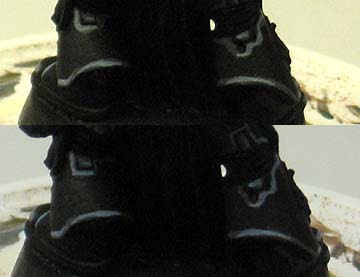 When I started adding highlights and other features of the model it actually started to look like it might be black. This supports your point that the other details of the model are the most important in making the model stand out. In this case they are also vital in making the black areas look black. Washes certainly helped to tone it down and the great thing is that you can add shading in the recesses. I think I'd try starting from a slightly darker basecoat next time though. Priming with the right shade of grey would simplify things by eliminating a whole step. The Chaos army I am putting together at the moment is going to be the Black legion so I'll have a lot of black on my models. This article and the links embedded should be a great help in getting what I want out of the army, so muchly appreciated. Kudos. Col: I do the same thing when I prime my models black, I go back with a bottle black and tidy them up before beginning to paint. South: I'd be interested in seeing how your stuff turns out. Draz: Glad it helps. I'm trying to add as many relevant links to articles this year as possible. Yellow is the harderest. It's science. Very interested in trying Tim Davis (The Vanus Temple)'s approach (link in the article above). 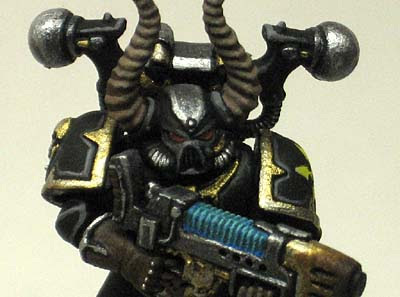 I am about to try a new Raven Guard force and was wondering if anyone had tried this technique with success? Better yet, I was also thinking of using this technique and then doing a final extreme highlight with a muted blue, very feint but just to give it a slight blue tinge. Anyone else already gone down this route and could comment? Callum: I have not tried it myself. I think I remember seeing somewhere that you just need to be careful in your wash application so as not to get any pooling or uneven surface coverage. If you do give it a go, make sure to let us know how it works for you!